We are excited to launch our new investment platform – La Trobe Direct. 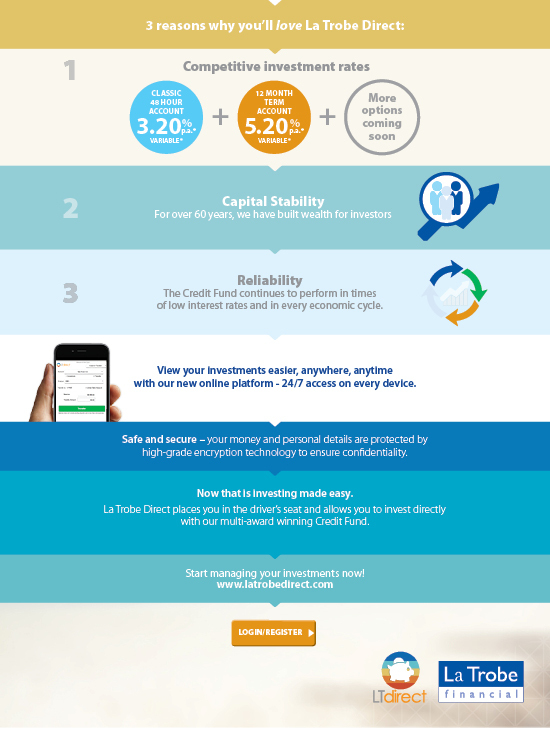 La Trobe Direct is a leading edge investment platform that enables you to invest directly into our multi-award winning Credit Fund. You will have 24/7 access, anywhere, anytime all with a touch of a button. * The rates of return from the Fund are not guaranteed and are determined by future revenue of the Fund and may be lower than expected. Investors risk losing some or all of their principal investment. The investment is not a bank deposit. - Past performance is not a reliable indicator of future performance. - The award and ratings were given to the 12 Month Term Account within the La Trobe Australian Credit Fund.